Found in Africa and the Gir Forest of northwest India, lions are formidable hunters. Prides, composed of four to six females, work together to take down large prey, such as zebra, wildebeest, impala and buffalo. Hunting skills are developed as cubs through the use of play-fighting among relatives. A lion’s diet also consists of small rodents, hares and reptiles, which can be hunted and killed by a solitary lion. Males live in pairs or small groups until they’re able to take over a pride. 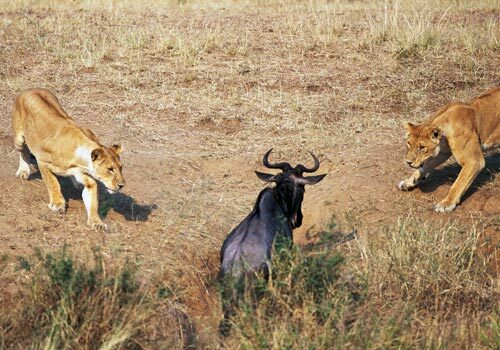 The males defend their large territorial areas against other male intruders to protect their mating rights with the prides that live within their territory. 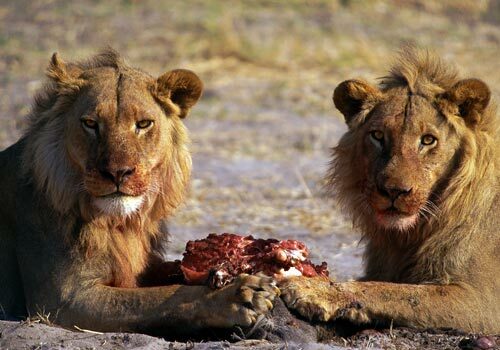 A lion’s back teeth (called carnassals) work like a pair of scissors, which comes in handy when tackling a fresh piece of meat. 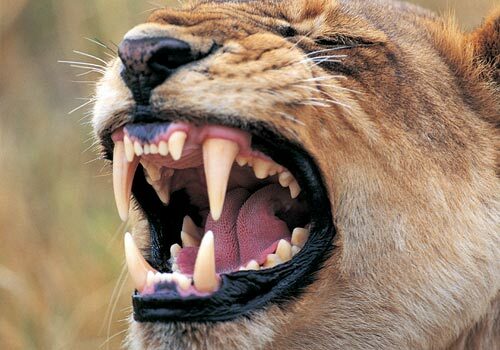 Though the teeth help cut up their meals, lions don’t actually chew their food, but swallow it in chunks, using only one side of their mouth at a time. 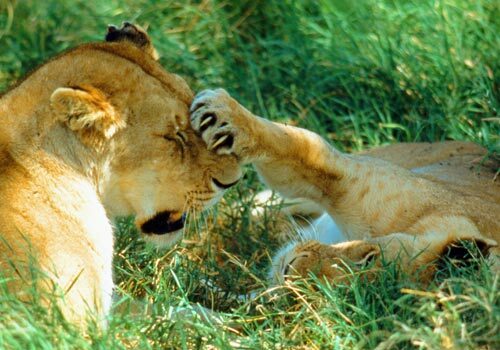 A lion’s claws are not only very sharp, but also retractable, which helps maintain the big cat’s slice-and-dice capabilities by preventing injury during play. Their claws grow as a series of layers. These eventually shred to expose new claws that can reach lengths of up to 1 1/2 inches from the base to tip. 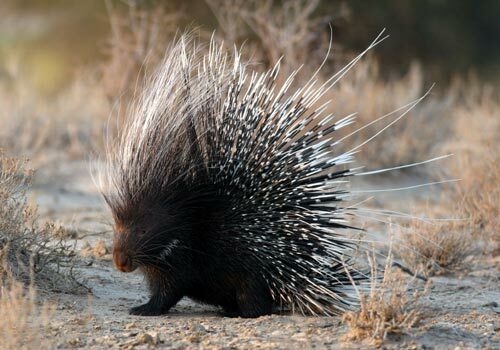 The lion’s worst enemy might come as a surprise, as the culprit is the size of a small dog: turns out the porcupine is the thorn in the big cat’s side, or rather mouth, as a lion tricked into sniffing the clever porcupine’s sharp quills often ends up with one or more stuck in its jaw for life. Talk about a glutton! 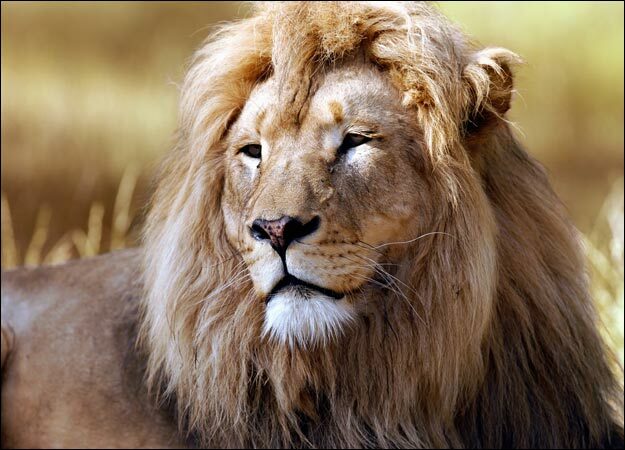 A lion will eat around 40 pounds of meat in one sitting on average. It then follows up its meal with the ultimate food coma, as it snoozes post-gorge for up to 24 hours. Maybe the phrase “the lion’s share” should be revised to “lioness’s,” because when it comes to putting food on the table, the female pulls the most weight. Lionesses not only secure dinner but serve the males first, even before the cubs! Though a lion can’t actually roar until it’s 2 years old, once the switch is flipped, it’s hard to ignore. The mighty bellow used to ward off predators has enough force to raise a cloud of dust and can be heard up to five miles away! glad that you liked the post, please visit our site again and you will always find new posts.